You are browsing the archive for Setups. Calendar Exception Template is an easy way of managing exceptions like holidays instead of building in the calendar manually. 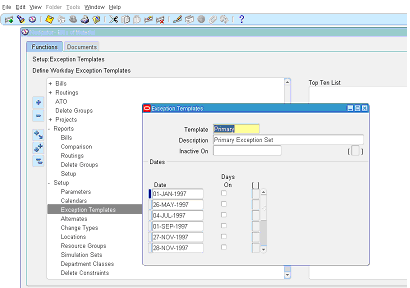 Once you create and save the exception templates you can apply them to any calendar. 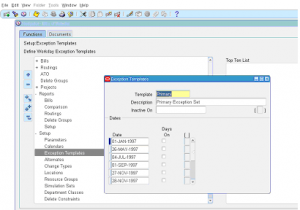 Navigate to BOM responsibility -> Setup -> Exception Templates. 3 ) Enter inactive date if you would like to end date the template. 4 ) Enter the date, check to indicate whether it is ON exception or OFF exception. 5 ) Click on ‘SAVE’ to save the template. Setups you must perform to enable BOM module.